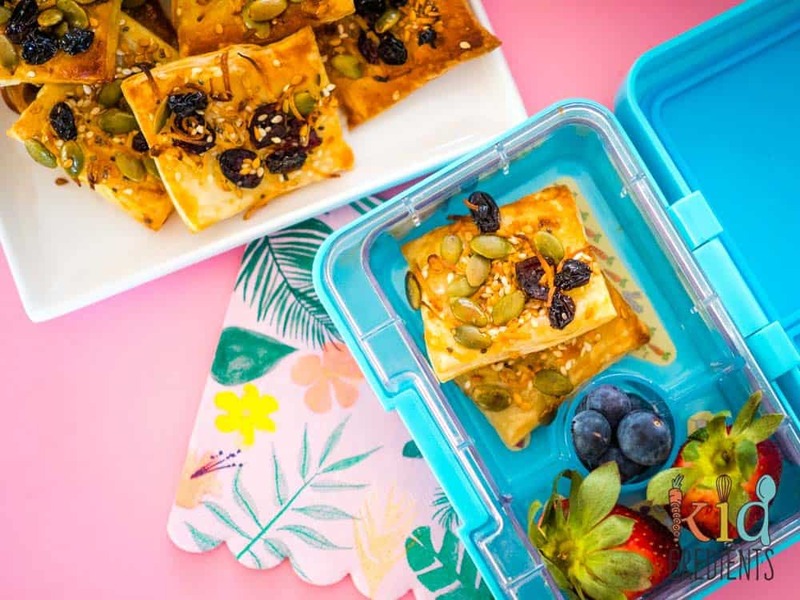 When it comes to school lunches, it’s often hard to find crunchy nut free snacks that are relatively healthy. 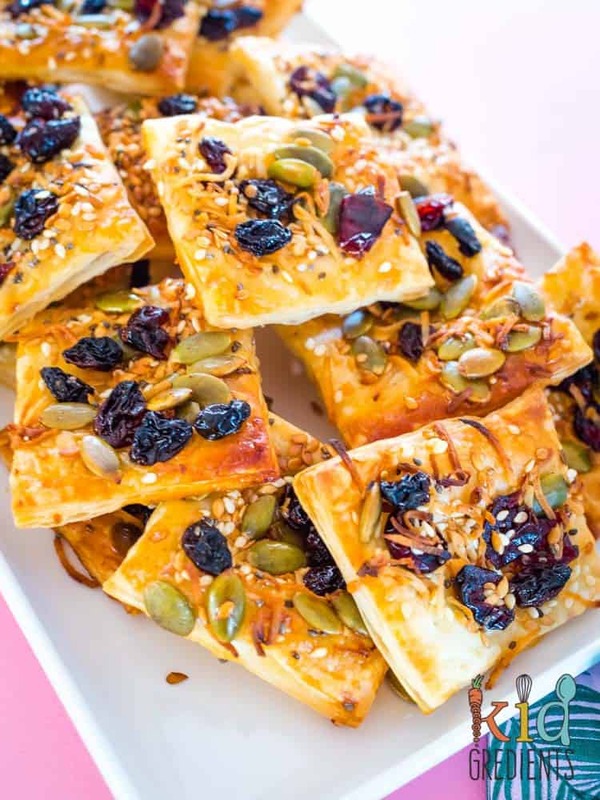 These nut free trail mix pastry snacks are quick to make, plus they have the added bonus of being crunchy and yummy. I’ve been trying to make some trail mix biscuits for a while, but I find that most of the actual trail mix just falls off the biscuit if I’m trying to bake the biscuit at the same time as attach the trail mix…and if I do the biscuit first…well they ended up super dry and not pleasant. So these are a compromise. A good one. The reality of these is that they are so easy to make, I microwave the butter and honey together to melt and it only takes about a minute. You could choose to do it on the stove. 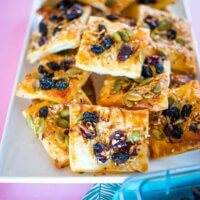 Either way, these nut free trail mix pastry snacks are quick to whip up. They are also super versatile, feel free to add nuts if you want to, but in the interests of school, I have kept them nut free. 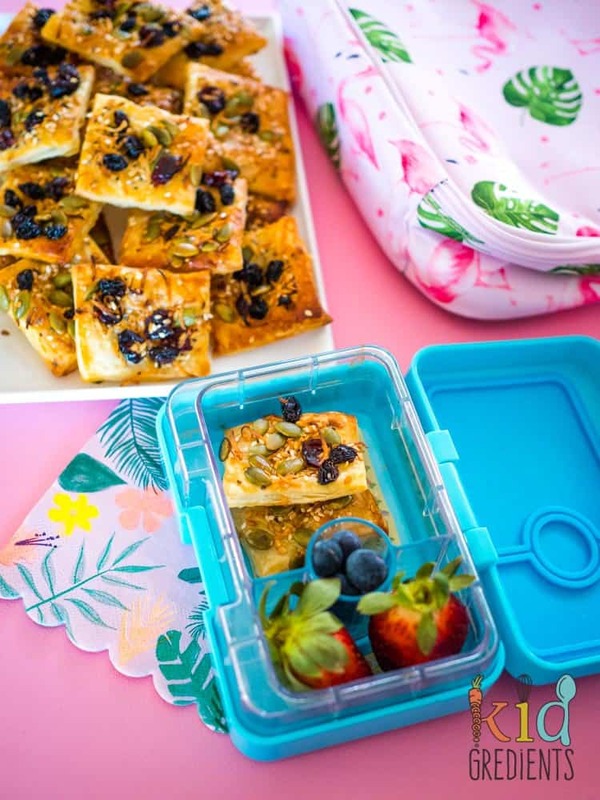 These are the perfect snack for picnics, after school or in the lunchbox as they stay well together and don’t really need refrigeration as they are pretty much a biscuit. You can’t really freeze these, but they will stay fresh for a few days in the fridge in an airtight container. If you’re worried you won’t get through them…then make half the batch or do what I did and take some into school for the hardworking teachers! 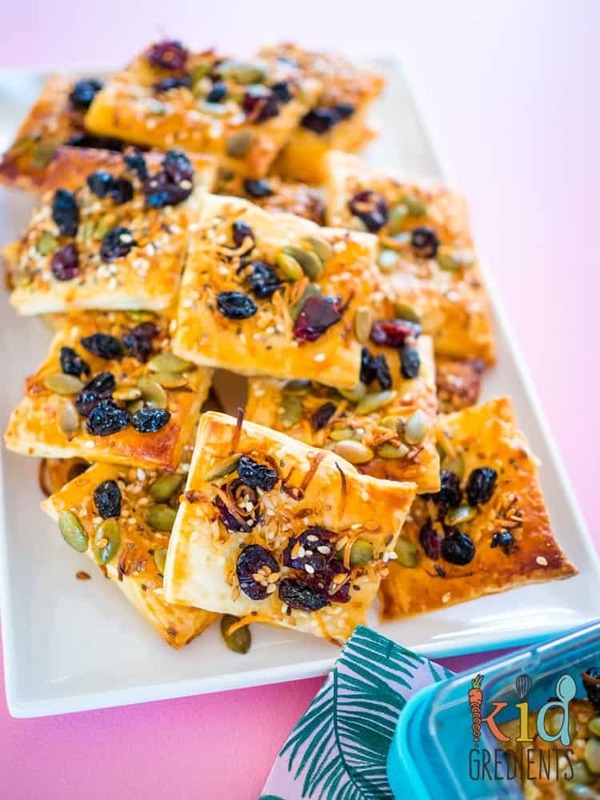 There is honey in these, but it’s kind of the glue that holds them all together and to be honest, these nut free trail mix pastry snacks would be very BLEURGH without it! Looking for more nut free crunchy snacks? Try our roasted chickpeas! Again, nut free and super crunchy. 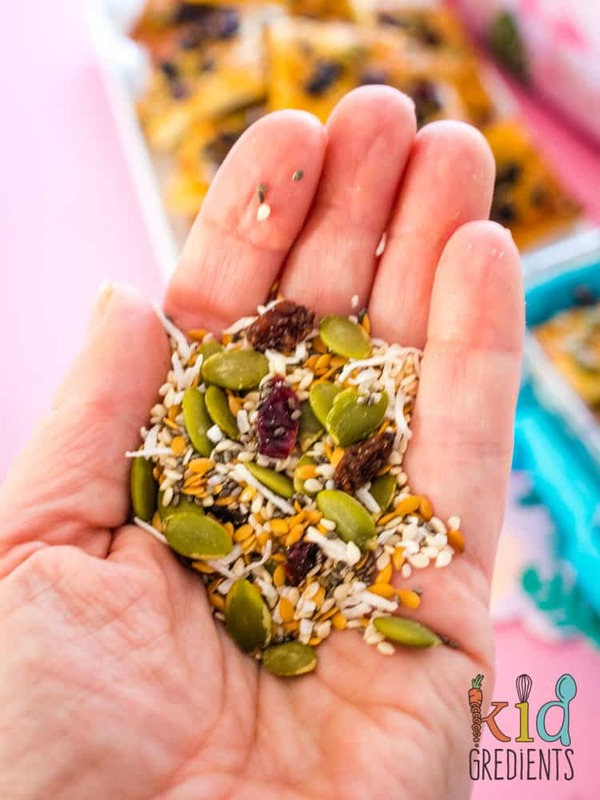 Or this whole post is 12 nut free no-bake freezer friendly bites and snacks if you can’t be bothered baking! 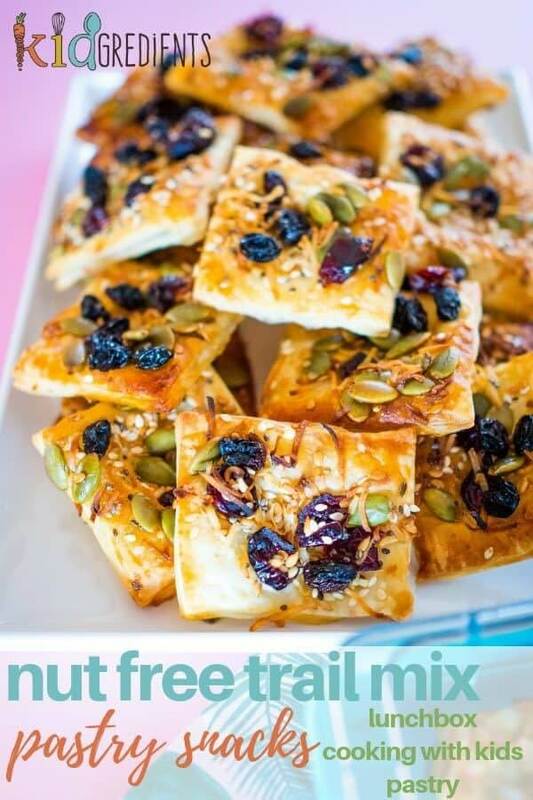 These nut free trail mix pastry squares are perfect as an afternoon pick me up or as a recess snack. Make them in only 20 minutes! Preheat oven to 200 degress celsius. Melt the honey and butter together. 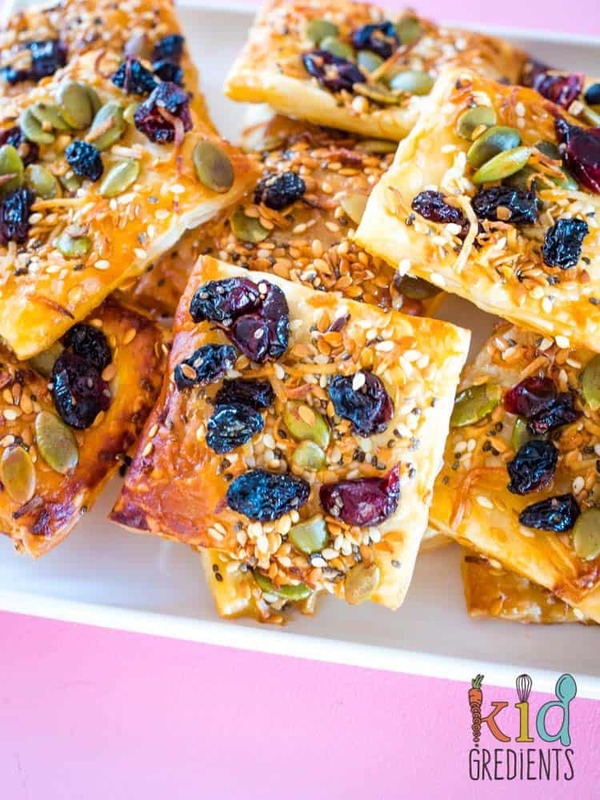 Combine all the seeds and dried fruit together. Cut each sheet of puff pastry into 16 squares. Prick each square all over with a fork. Brush each square with the honey and butter mixture. Sprinkle on the fruit and seed mix. Drizzle with the remaining honey butter mixture. Bake at 200 degrees for 15 minutes. Cool on the tray for 5 minutes then transfer to a wire rack.